Faces by Stacy Specializes in Eyebrow Shaping and Makeup Application with almost 20 years experience in the Beauty Industry - in Salon, Bridal, on Location, Runway, Print, TV, and Film. We offer Brow Shaping via Wax and/or Eyebrow Tweezing (for sensitive skin), Basic Facial Waxing, Lash Tint, Brow Tint, Wedding Makeup, and Special Event Makeup Application. We're also available for House Calls and On- Location Bookings. We operate Weekly from Sweet 1017 Hairdressing in Seal beach, Ca, with freelance and on location services in the Venice Beach, CA and the Greater Los Angeles areas. We offer beautiful, Natural Brow Shaping and Makeup Application. 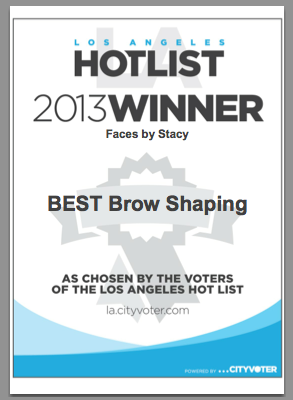 Stacy placed in the top two on the Los Angeles Hotlist 2012 for Best Brow Shaping in All of Los Angeles and 1st for Brow Shaping in Venice Beach. Then won Best Brow Shaping on the Hotlist in 2013. Sweet 1017 Hairdressing has been named OC's Best Hair Salon twice by OC magazine and continues to be Seal Beach's premiere spot for great Haircuts, Color, Makeup and Brow Shaping. The business owner, Stacy Withrow, started out working for the Allen Edwards Salons when she was 17 where she was exposed to the Senna Cosmetics Brow and Makeup Artists who worked in house. Inspired by the Art of Makeup, she attended beauty school, and was hired with Senna in Beverly Hills where she trained under Eugenia Weston. After completing an assistant program in Los Angeles she went on to build a Loyal Clientele at the Toni & Guy and Stellar Salons in Long Beach, Ca and began traveling to and from NYC where she participated in Fashion Week and its Editorial Opportunities. She currently maintains her freelance work in Los Angeles, Ca and caters to a devoted client base in Seal Beach at Sweet 1017 Hairdressing with a New Venice Beach Location to be announced. "I was first fascinated by Makeup and Beauty as a small child playing in my Mothers makeup drawer. I studied the fashion magazines and would try to emulate the looks I fancied on myself and my Sister. After working in a salon as a receptionist I was inspired to go to beauty school and when I completed my coursework, I immediately began pursuing makeup as a career. I had always loved to draw and brows serve as the lines that creatively define the face. Shaping them came naturally to me and I Love bringing out the perfection that is hiding beneath them. In the twenty years Ive been in the beauty industry I still don't get bored. I am still always learning and bringing new and fresh concepts to my work. I love what I do. I love my clients, celebrity AND civilian, and I love helping them get ready for those big events in their lives. Whether you're looking for makeup for a special event, pictures, a wedding, or want your brows done and yes I do men too, Id love the opportunity to create a look for you and I look forward to meeting you!"